Boxing has a rich heritage in South Wales and a breeding ground for boxing champions and this golden conveyor belt is about to produce another. Chris Jenkins (24), who hails from Maes Yr Hendre in Garnant under the guidance of trainer Ronnie Morris, is climbing the light-welterweight rankings in a manner most thrilling! Jenkins is displaying all the requisite traits essential for champion material including an appetite to learn and work. Fused and aligned with his blazing hand speed, shot selection to the head and body and nimble footwork, it makes him a formidable opponent to those currently blocking his path. Jenkins had a solid amateur pedigree having collected six junior Welsh titles, one gold and two silver medals at the Four Nations Games, three Welsh senior titles and a gold at the Canada Cup. He has competed at two Commonwealth Games and also the 2011 World Amateur Championships but his style of boxing has always been more suited to the professional game. To date he remains unbeaten, four of his five wins have been by knockouts and on each occasion he has progressively impressed. We talked extensively to the legendary Jimmy Bromfield (trainer of five British and 15 Welsh champions), he said this of the exciting prospect: "Ronnie, Paul and I are all excited about Chris but we are not getting carried away. There are no concerns with him, he is settled with twin-boys and his attitude is first-class in and outside of the ring. I have known him since he was 14-years old, he is one of the most talented fighters I have seen at this stage of a professional career, he is confident and has what it takes to go to the top." When we asked if there were concerns about his defence, Bromfield replied: "It is not a concern but something we are working on, as he goes up the ladder he will need to improve that aspect but at the moment he is knocking them out." Finally we asked him will Jenkins become British champion? He replied: "We'll see." Last Saturday he emphatically beat the older six-round boxer Dave O’Connor. He knocked him to the canvas on three occasions before the referee Martin Williams stopped the fight after 38 seconds into the second round. He is now ready and bursting to step up to six rounds and take on the more experienced fighter. There is no uncertainty, this fighter will win the Welsh Title sooner rather than later before stepping up to take the British. Skill apart, he has already amassed world experience. At 17-years of age he became the youngest boxer from Wales ever to be selected for the Commonwealth Games. The Cwmgors Boxing Club prodigy was nominated into the flyweight berth for the March 2006 Melbourne, Australian games after giving many mature displays for one at such a tender age. 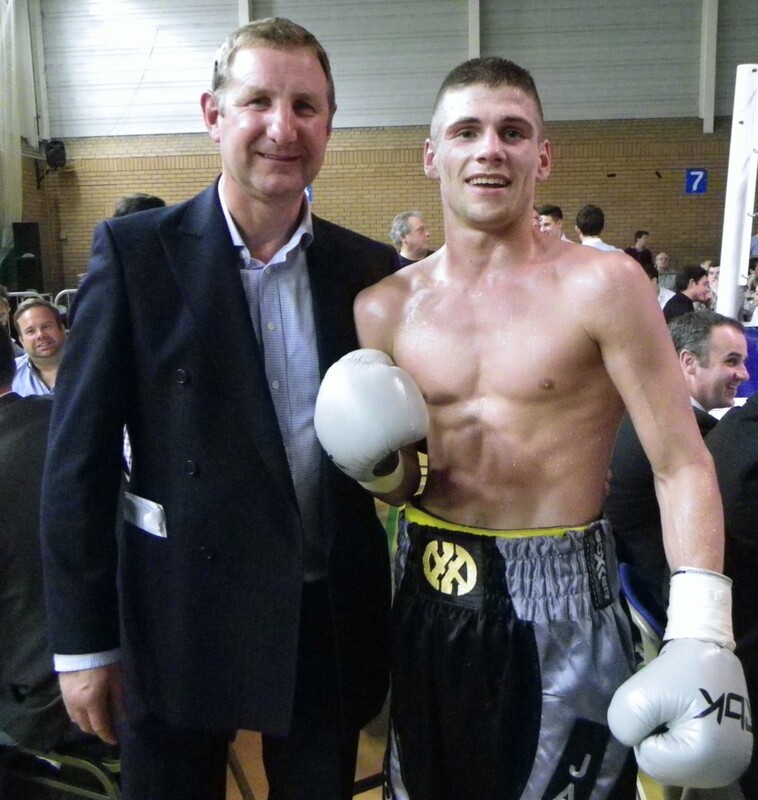 Promoter Paul Boyce and boxer Chris Jenkins celebrate another win! His manager and promoter Paul Boyce (pictured) has no intention of rushing things, he appreciates the jewel in his midst, he knows he has a champion and wants the boxer to realise and fulfil his obvious potential. He said: "I think Chris could be the next Ricky Hatton, he won almost everything he could as an amateur, and he is destined for big things. He is a really talented boxer who I believe will be at least a British champion." The Racing Horse first met Chris Jenkins four years ago when he was helping yours truly with a back complaint at Jo Bromfield's 'United Therapists' Sports Injury Clinic in Pontardawe. We were struck then by his absolute love of the boxing game. He was born to fight. Since then we have followed his professional career very closely and there is every indication he is the real deal! We are a regular visitor to the Cwmgors Amateur Boxing Club and can confirm the excellent work that Ronnie Morris does with him and his other boxers there!